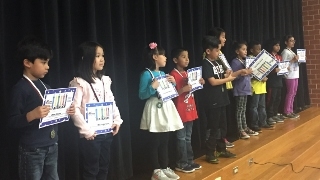 Our Character Awards were given out for Fairness on Friday, February 23 during a house assembly with our students and staff. The character trait was Fairness and the students were Makayla Young and Omar Ibanez for Kindergarten, Emily Rodriguez Lugo and Josue Romero for 1st grade, Prisilla Landeros and Jacob Zamarripa for 2nd grade, Araceli Moreno and Keishaun Reeves for 3rd grade, and Tawan Gill and Calobe Irizarry for 4th grade. 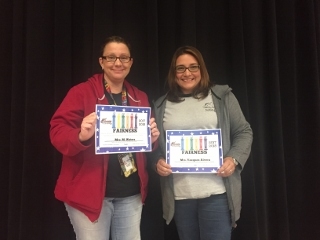 Our teachers were Mrs. Michelle Waters and Mrs. Madelyn Vazquez-Rivera. Congratulations to our students and teachers who represent Fairness!